"This dissection of the kidneys was done after red latex was injected into the arteries and blue latex into the veins." See The Body in Depth from The New York Times. 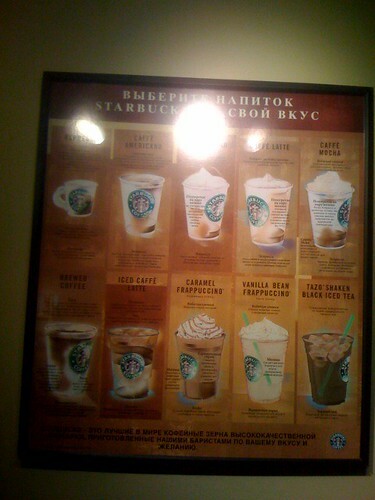 Russian Starbucks, Brighton Beach, Brooklyn, originally uploaded by KidneyNotes. To investigate the neural substrates that underlie spontaneous musical performance, we examined improvisation in professional jazz pianists using functional MRI. By employing two paradigms that differed widely in musical complexity, we found that improvisation (compared to production of over-learned musical sequences) was consistently characterized by a dissociated pattern of activity in the prefrontal cortex: extensive deactivation of dorsolateral prefrontal and lateral orbital regions with focal activation of the medial prefrontal (frontal polar) cortex. Such a pattern may reflect a combination of psychological processes required for spontaneous improvisation, in which internally motivated, stimulus-independent behaviors unfold in the absence of central processes that typically mediate self-monitoring and conscious volitional control of ongoing performance. Changes in prefrontal activity during improvisation were accompanied by widespread activation of neocortical sensorimotor areas (that mediate the organization and execution of musical performance) as well as deactivation of limbic structures (that regulate motivation and emotional tone). This distributed neural pattern may provide a cognitive context that enables the emergence of spontaneous creative activity. Image via WikipediaThe Genes in Myopia (GEM) Twin Study: “We have literally busted the myth that people who wear glasses are introverted or have particular personality characteristics. They are more likely to be agreeable and open, rather than closed and introverted,” said Prof Paul Baird of the University of Melbourne’s Centre for Eye Research Australia. 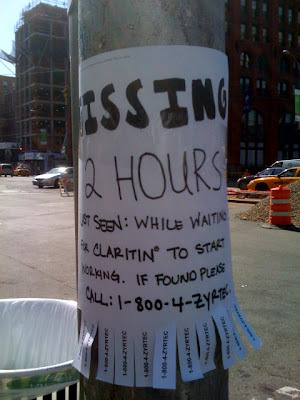 "Missing: 2 hours. Last seen: while waiting for Claritin to start working. If found please call: 1-800-4-ZYRTEC." Apparently, drug advertising has gone viral. Children and adolescents who included flavored milk in their diets reported higher total milk intakes than consumers of exclusively plain milk. Intakes of vitamin A, calcium, phosphorus, magnesium, potassium, and saturated fat (adjusted for energy intake and age) were generally comparable among milk drinking groups, whereas intakes by milk nondrinkers were significantly lower. Among females aged 12 to 18 years, calcium intakes by flavored and exclusively plain milk drinkers were 992+/-41.5 and 1,038+/-22.5 mg/day, respectively, whereas intake by nondrinkers was 576+/-11.7 mg/day. Intake of added sugars did not differ between flavored milk drinkers and milk nondrinkers. BMI measures of milk drinkers were comparable to or lower than measures of nondrinkers. It has been suggested that the observation of another person's action affects the behavior of the observer because the observation of action leads to the excitation of similar response codes in the observer. It is unknown, however, if one must witness the action or if it is sufficient for one to believe that the other agent is responding for response co-representation to occur. To this end, participants in the present study performed a joint spatial-compatibility task with a confederate when: (1) the confederate sat beside the participant; and, (2) the confederate left the room and told the participant that they would continue to perform their component of the task on a networked computer in another room. Even though participants believed that the confederate performed the task in another room, joint spatial-compatibility was only observed when the confederate was present. These results reveal that the actions of another person may only be represented by the observer when the observer is able to witness a portion of the action. Gilbert presents the results of four experiments, all involving predicted versus actual enjoyment of a very simple experience—eating potato chips. In three of the experiments, participants predicted how much they would like eating potato chips before, after, or instead of eating a much better food (chocolate) or a much worse food (sardines). They then ate the chips and reported how much they liked them. The results showed that the chocolate and the sardines had a large impact on participants’ predictions, but no impact whatsoever on their actual experiences. Those participants who compared the chips to sardines overestimated how much they’d enjoy eating the chips, and those who compared them to chocolate underestimated how much they’d enjoy eating the chips. Tactical Internet Pants from merlinmann on Vimeo. Social interaction is a central feature of people's life and engages a variety of cognitive resources. Thus, social interaction should facilitate general cognitive functioning. Previous studies suggest such a link, but they used special populations (e.g., elderly with cognitive impairment), measured social interaction indirectly (e.g., via marital status), and only assessed effects of extended interaction in correlational designs. Here the relation between mental functioning and direct indicators of social interaction was examined in a younger and healthier population. Study 1 using survey methodology found a positive relationship between social interaction, assessed via amount of actual social contact, and cognitive functioning in people from three age groups including younger adults. Study 2 using an experimental design found that a small amount of social interaction (10 min) can facilitate cognitive performance. The findings are discussed in the context of the benefits social relationships have for so many aspects of people's lives.